I can see the Embothrium (Chilean Firebush) right outside my office window. Occasionally I peek out in hopes of seeing hummingbirds. The tree’s fluorescent orange red flowers make it a hummingbird magnet. What began with taking a few photos from inside the window, turned into climbing out onto the roof periodically throughout the day for attempts at photographing hummingbirds. They are highly territorial and fierce birds. They seem very confident in their speed and ability to outmaneuver potential predators. During one peek outside, I saw three zooming around it. One sped straight up into the sky. I grabbed the camera sitting on my desk, and dragged myself out the window to my second story perch. Suddenly they’re gone. I waited 20 minutes. No hummingbirds. Within seconds after I hauled myself back through the window, one returned. I’m shooting but the digital camera shutter lag is much slower than the hummingbirds. They are so fast, I’m not sure if I’ve captured them until I look at the shots on my monitor. They have fantastic flight control. Because our cats also enjoy bird watching, the hummingbirds tend to stay on the far side of the tree where it’s more difficult to get a clear shot. In the interest of getting the hummingbirds to come right up to me and knowing they are attracted to red, I put on my bright red sweatshirt, climb back out through the window onto my roof perch, and wait. Immediately 3 hummingbirds zoom by the Embothrium at high speed. The acrobatics are phenomenal. I try to follow them with the camera, at the same time being careful not to fall off the roof. Here you can see the whole upper part of the tree with a hummingbird pasted against the sky at left. I spent a fair amount of time perched on the roof watching, waiting, and occasionally shooting. Why there aren't more Embothriums planted in Seattle is beyond me. It's such an exciting tree for hummingbird watchers like me and my cats. From 1960, the American Petroleum Institute brings us this informative film about oyster farmers in Louisiana who are angry at the oil drilling industry. Well, guess what? The oil isn’t hurting the oysters. In fact, they love oily water. Americans buy 29 billion water bottles a year. It takes 17 million barrels of crude oil to make all these bottles. That’s enough oil to keep a million cars going for twelve months. That is the same amount of oil as 60,000 barrels a day spilling into the Gulf for 283 days! I’ve been avoiding turning BOX TURTLE OASIS into a platform for environmental ranting. However, building man-made environments while real natural environments are being rapidly destroyed right before our eyes, pushes me to look for things we can do. It’s estimated that the BP gusher is releasing up to 60,000 barrels of crude into the Gulf each day. Americans buy more bottled water than any other nation in the world — 29 billion water bottles a year. Imagine a water bottle filled a quarter of the way up with oil. That’s about how much oil was needed to produce the bottle. In order to make all these bottles, manufacturers use 17 million barrels of crude oil. That’s enough oil to keep a million cars going for twelve months. That is the same amount of oil as 60,000 barrels a day spilling into the Gulf for 283 days! That oil is being used to make stuff we don’t actually need. If we don’t need it, then why are we doing high risk drilling? Or, maybe I’m wrong and those water bottles really are important. Image and water bottle data taken from National Geographic Kids. This exquisite Great Blue Heron, Ardea herodias who wants to eat our goldfish. It is the largest North American heron, with a head-to-tail length of 91–140 cm (36-55 in), a wingspan of 167-201 cm (66-79 in), and a weight of 2–3.6 kg (4.4-8 lbs). On several occasions recently I’ve been hearing someone or something walking on the roof. It’s way too early for Santa. Could it be that exquisite terror from the sky, the Great Blue Heron? We have a small backyard pond, full of large delicious goldfish, the descendants of classroom goldfish. The sound of something on the roof stops and I stealthily head out into the yard, camera in hand, hoping to capture a photo of the heron at the pond. He sees me first and leaps into the air before I can take his picture. He’s incredibly tall, slender, and difficult to see, his sky gray colors an effective camouflage. Although I expected to see him, I’m nonetheless startled. The best I can do is take his photo in my neighbor’s tree where he has gone to wait. One of our neighborhood crows (Corvus) on alert in the golden-leaved Robinia pseudoacacia 'Frisia' tree. The kiwi vine Actinidia deliciosa has climbed into the tree. Today, a large murder of crows alerts me that something interesting is on the roof. I wait, hoping to catch the heron at the pond. Once again, the heron sees me before I see him and takes off. In writing about the garden, it’s become clear that the garden has become an amazing habitat for wildlife, an urban oasis. We are mostly surrounded by urban yards with minimal plantings. The yard across from ours is by design a barren gravel wasteland. From the alley, our fence resembles the fence in Jurassic Park, a dividing line between the domesticated and wild places. Looks like some kind of Praying Mantis to me. I asked my friend Tracy Mills to write a short piece about her move from Seattle to Maui. Her husband Big Neil provided the photos. I stood in our new yard, filled with hesitation and intrigue. Trowel in hand I stared at the small garden plot surrounded by Banana and Heliconia plants, and it seemed, a million others unknown to me. I didn’t know which were weeds and which might be growing with a purpose. I knew that I knew nothing. My husband and I had just moved to Maui and I was eager to get back into gardening but I felt a bit “at sea”. Don’t get me wrong — I have been weeding and working in my own gardens for most of my life in the Pacific Northwest with some success. There, I knew what the weeds were and what I wanted — it was as easy as breathing. Now, I live in Hawaii — Zone 11, the place where you can garden year-round. The author, Tracy Mills in her new Maui vegetable garden. The earthworms are one of the first differences I noticed once I stuck my shovel into the garden plot. They come out of the ground flipping, wriggling, and looking terrified. I have named them “Screamers” and I try to put them under an inch of soil as quickly as I can to ease their apparent suffering. I did a little work in that garden but we were soon to move, so it was more exploration than production. As quickly as possible, I signed up for a worm composting seminar. Maybe I needed to learn the worms, first? Worm School was interesting and I was very glad to have attended. Turns out it’s a whole different ball of worms on in Zone 11. I also discovered the Native Hawaiian Plant Society and began communicating and then working with them. I met a few of their members at a local flower fair and we’ve now been taken through their native plant roster at their own homes. My husband and I learned a lot as we walked through their gardens but much of what we saw and heard was put on video for review and retention. I’ve decided it’s a great way to get to know the plants as well as getting to know the people who care about what they’re putting in the ground. The island gardeners are challenged by the hundreds of microclimates. One mile in one direction will have your Ohia Lehua fraught with mold problems, while one mile the other way your Banana plant leaves will be shredded by the beautiful but sometimes strong tradewinds. We live in Haiku on the North Shore, the windward and wet side of Maui. I will find Ohia babies (keikis) fom the same area and our Banana plants will be planted where they’ll have as much protection from the wind as possible. I believe it’s true everywhere that if you plug the right plant into the right place, there’s little need for watering or for fertilization. Good mulching means little weeding — just enough weeds left for us weed-aholics. Koa tree: in 20 years it can grow to be around 80 ft. tall. In one or two months, we’ll be moving to a newly-built home on 1 acre. The owners are installing basic landscaping and have welcomed our additions, so we’re going to put in our food garden from which we’ll be able to eat year-round. We’re going to surround ourselves with food trees and plants (Banana, Avocado, Breadfruit, Citrus, etc.) as well as native Hawaiian plants. Red flower is Lehua - it's the bloom of the Ohia tree. The bees make a most delicious honey from this flower! Pictured, is the Ohia Lehua, Metrosideros polymorpha, this is the official flower of the island of Hawaii, which was apparently the first plant to grow on the islands from the seeds “carefully distributed” by overflying birds. Lehua honey is already a favorite of ours and the shrub or tree encourages more of the native (mostly endangered) birds and it’s a natural for use as a windbreak. A grouping of Ohia Lehua (red) and Ohia Moa (yellow) will be our first planting after the food gardens are in. A wider view of the trellis. Made from the timber bamboo known as 'Moso', which is commonly used for building scaffolding in Asia. I put it together using tan colored decking screws. Pre-drilling avoids splitting. The kiwi produces the same fuzzy fruit you can buy in the supermarket. The foliage creates a lush tropical effect. “The Day of the Triffids”. The Day of the Triffids is based on the post-apocalyptic novel of the same name written in 1951 by the English science fiction author John Wyndham. The protagonist is Bill Masen, an Englishman who has made his living working with “Triffids”, plants capable of aggressive and seemingly intelligent behaviour: they are able to move about on their three “legs”, appear to communicate with each other and possess a deadly whip-like poisonous sting that enables them to kill and feed on the rotting carcasses of their victims. The book implies they were bioengineered in the Soviet Union and then accidentally released into the wild when a plane carrying their seeds was shot down. Triffids begin sprouting all over the world, and their extracts prove to be superior to existing vegetable oils. The result is worldwide cultivation of Triffids. In a 2009 BBC mini-series version, the herbal creature was created by a scientist who mutated the Triffids to produce a green source of oil that the world craves. Let that be a lesson to those who believe a green energy source is just around the corner. Just around the corner indeed! Documentary Film: “A Man Named Pearl”. Thank you to Cathy for sharing this amazing find. I watched this last night on DVD. It’s available from Netflix and the Seattle Public Library. I’m starting to create a list of horticultural-themed films. “Day of the Triffids” is another must-see. The hummingbird infestation continues. Watching them and photographing them are two different matters. I’m sure they’re toying with me. Today I saw a sand-colored one, or was it two, or three. They’re here, there, and everywhere within moments. One was just sitting on a branch looking at me. When I attempted to take its photo it zoomed away. So, here are a few other images from today. Even my favorite specimens seem dull compared to the hummingbird-infested Embothrium coccineum (Chilean Firebush). This is Salix Magnifica, the Magnificent Willow, from Szechuan province of China. It has the largest leaves of any willow. Its leaves look more like those of a Magnolia. The catkins on the male tree point up while those of the female point down. Or maybe it's the other way around. Here are some new shoots of Phyllostachys aureosulcata 'Yellow Groove Bamboo'. Some people are afraid of bamboo, to which I say "Fear not the bamboo!". Here's how some of the culms grow. Growth is rapid, particularly on warm days, when the bamboo can grow a foot or more. The new growth is still soft and pliable, and the culm bends under its own weight. It likely hardens during the night. The next day the new growth grows toward the light, turning upward. This happens throughout the growing period, resulting in multiple zig-zags on the same culm. Not every new culm will do this and most types of bamboo never do it. This is a Windmill Palm, Trachycarpus fortunei in bloom. These are 100% hardy here in Seattle where they have been grown for 100 years. This is the most reliable of all the palms in terms of cold hardiness. 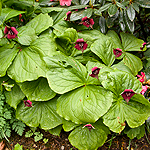 They are an essential part of the tropicalistic style of gardening we can achieve here in the Pacific Northwest. The most palm-crazy subtropical gardeners I know live in British Columbia. Are we over-compensating for the long dark winters we endure? You betcha! This Golden Hops is so gorgeous. It's a shame I'll be cutting it down before it smothers the Hebe and Amelanchier it's climbing up. The dried hops flowers are used for making beer. This is one vigorous vine. As Casey Stengel once may have said, "If you look, you will observe things". I take that advice to heart. While climbing a ladder in yet another failed attempt at capturing the graven image of a hummingbird, I spied a group of crows chasing their mortal enemy, the American Bald Eagle. The eagles are notorious nest robbers. Here's a glimpse of that new hummingbird I've been chasing. Paulownia tomentosa (Empress Tree) looking very much like a lilac on steroids. I bought this bareroot — pretty much a stick of wood. It grew 8-10 feet tall the first season, with ginormous heart-shaped leaves. Through its second year it looked like a sunflower plant on steroids. It quickly grew to near its current 25 ft. tall full size in about 3 years. 15 years later, its growth has slowed to the point of being barely noticeable and the leaves are about 1/4 their first-year size. Introduced to the US from China and Japan, where it was prized. The genus is named in honor of a Russian princess, Anna Paulownia, daughter of Czar Paul I. 'Tomentosa' refers to the hairy or tomentose leaves. Perhaps the princess was also hairy or tomentose? Looking out a window at an enormous tree Rhododendron. I really should know the name of this wonderful rhododendron. I came across this blue blackberry leaf yesterday while on a bike ride. I think it may be some kind of hobo code. Bird on a wire. These hummingbirds are becoming such a nuisance. If you’re sick of looking at hummingbirds, please turn back now. Here’s the catch of the day. Fairy feasting on Chilean Firebush flower. Japanese Arrow Bamboo in background. A fairy caught in the act. New leaves emerging on Firmiana simplex (Chinese Parasol Tree), a hardy small tree with a tropical look. 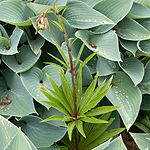 When fully formed, the leaves are about 12" across. This is a busy time of year for Mother Nature. Following yesterday’s massive rainfall, you can just about see everything growing. The battle for plant supremacy is on. I arrived home just past 7 PM and walked around looking to see what new and visually interesting things were happening. It’s limitless. Here are a few of images taken today in the garden. Calycanthus occidentalis (Spicebush): Apparently native to west coast of US. Kniphofia uvaria (Torch Lily, Red Hot Poker): Originates from South Africa. Mass quantities of rain today encouraged all the snails to have a parade. They are at their most luxurious when the weather's wet. This is the first installment of what I hope will be a regular feature. There’s always something interesting and amazing happening in the garden. My enthusiasm for documenting it is sometimes not there. Then there’s the matter of producing a photo worth sharing with you. I have some photos of blurry bees in the Ceanothus I was hoping to post. The bees didn’t look at all blurry in real life. I really should read my camera’s manual. Enough excuses. Here are a few bold plants strutting their stuff. Actinidia kolomikta (Variegated Kiwi Vine). I believe this is a male plant, as it produces no fruit. Lithocarpus densiflorus 'echinoides'. The shrub form of the Tanoak. I bought this as a seedling from Mark Mueller of Fairmeadow Nursery (Olympia), who grew it from acorns he collected in the Siskyou Mountains of Oregon. I have another from a different source. The one shown here has much glossier leaves. I enjoy the new foliage of this plant at least as much as the peony flower below. Here's another image of the Lithocarpus densiflorus 'echinoides', showing the newly forming acorns. The name Tanoak refers to its tannin-rich bark, used in the past for tanning leather before the use of modern synthetic tannins. Lithocarpus densiflorus, commonly known as the Tanoak or Tanbark-oak, is an evergreen tree in the beech family Fagaceae, native to the western United States, in California as far south as the Transverse Ranges and north to southwest Oregon. I believe I read it is considered to be a link between the oaks and beeches. Trachycarpus wagnerianus (Dwarf Chusan Palm) beginning to bloom. This is a less common palm than the T. fortunei (Chinese Windmill Palm) commonly grown here in Seattle. T. wagnerianus has significantly stiffer foliage and a narrower crown with age than T. fortunei. 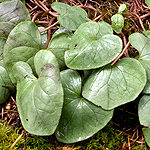 This plant is unknown in the wild and is thought to have originated in Japan. I don't know the name of this peony. Its flowers are a delicious chiffon citron color, and peak out, somewhat hidden within the foliage. The back garden is not as floriferous as it once was, having become more shaded and dominated by eucalyptus, bamboos, palms, and broadleaf evergreens. This textural garden makes a dramatic setting for anything that blooms. Embothriuum coccineum (Chilean Firebush) with Anna's Hummingbird right outside my window. I’m writing this just a few minutes after taking the above photo out my office window. It’s mid-May here in Seattle. Zone 8 if you believe in zones. The Chilean Firebush (Embothriuum coccineum) is in its full glory, thick with the most vibrant flowers of anything in the garden. Photos hardly do it justice. It hails from the temperate forests of Chile and Argentina. It’s a member of the family Proteaceae, which includes Protea, Banksia, Embothrium, Grevillea, Hakea, Dryandra and Macadamia. We are extraordinarily lucky to be able to grow this small hardy tree here in Seattle. Hummingbirds think so too. It is an absolute hummingbird magnet. My cats on roof next to Embothrium. This is the most exciting thing happening in the landscape right now. It will begin to drop its flowers in about 3 weeks. I’ve been encouraging garden fanatic friends to visit before it’s glory passes. It’s semi-evergreen and narrow — perfect for any garden. My tree is about 15 years old and 20 feet tall. I grew it from a 6-inch start with 4 leaves. It barely grew the first 3 years, but took off after I threatened to compost it. Another Proteaceae we grow in the garden is the silver-leaved Grevillea victoriae. It hails from New Zealand and blooms in winter here in Seattle. 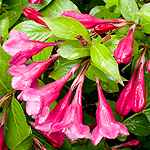 It is also an excellent hummingbird attractant at a time when there is a scarcity of plants in bloom. I just planted one outside my front window so that my family and our cats can enjoy watching hummingbirds in winter. As with most of the rare and interesting plants I’ve bought, I am not afraid to buy small plants and wait several years or more for them to strut their stuff. A wide variety of unusual plants are available from mail-order nurseries like Colvos Creek. Small plants cost less, travel well, and are less susceptible to stress and shock than larger specimens. My friend Ken "extracting" some of my 'Allgold' bamboo with the Bamboo Spade. My friend Ken has gone bamboo crazy. I used to be bamboo crazy, but now that I have about a dozen different kinds, I am less likely to experience the obsession to possess more. I still look wistfully at exceptional stands I see now and then, but I’ve learned to stop chasing after new ones. I’m 100% certain the bamboo has an as yet unknown method of reaching into our minds and telling us to plant it on our property, thus helping it propagate. It’s a commonly held view that the oak tree makes nutritious acorns so that squirrels will carry off and bury them. Many plants have a symbiotic strategy with animals, so why should we be excluded from the equation? Once you’ve gone bamboo crazy you’ll discover the cheap digging tools you bought at a yard sale are not up to the task. Back in the day I was a professional furniture mover. I’m not afraid of heavy lifting or excavation, but I’m not as young and care-free as I used to be. Dividing and excavating bamboo can be back-breaking work even with decent tools. Having the right tools for the job, even if they seem expensive, is much cheaper than the cost of a chiropractor, back-surgery, or the pain and suffering from an injured back or shoulder. I recently had the opportunity to use a heavy-duty tool designed specifically for the rigors of dividing bamboo. The tool is called a Bamboo Spade, and was designed by a professional bamboo grower (MidAtlantic Bamboo). I think of it as a bamboo “slammer”. It operates on the same principle as a pile driver. The Bamboo Spade combines an 8 lb. sharp steel spade with a 12 lb. steel ramming rod to facilitate cutting rhizomes and digging bamboo divisions. The impact action of the ram produces very cleanly cut divisions which can then be lifted out of the ground with a little prying. The process is more like surgical extraction than labored digging. The straight edge is sharp and can be periodically re-sharpened to a knife edge on a bench grinder or with a file. This is no dinky tool. It’s simple, well thought out, made of the highest quality materials here in the U.S., and best of all — it works! They even thought to put a safety cotter pin through the apparatus to keep it from sliding apart during transport and chopping your toes off. The 12 lb. ram slides into the handle of the 8 lb. spade. To those of you who are uncertain about the difference between a shovel and a spade, a shovel is more like a scoop, while a spade is more like a knife. The $175 cost is actually a good value for this professional quality tool that will last forever. It’s an essential tool for the amateur bamboo fancier, and would make an unforgettable birthday or holiday gift for the bamboo maniac in your life. The Bamboo Spade can be strategically positioned to sever rhizomes all around the division. It's the only tool that you can use on the inside of the clump, where a foot-powered spade cannot go. The story of how the Bamboo Spade was developed is an interesting one. When Bert Silverman of MidAtlantic Bamboo, (a Virginia bamboo nursery) had a stroke, he lost some use of one side as well as a great amount of balance. This presented a problem when digging bamboo, so Bert and his wife, Mary Ann, began thinking of ways Bert could continue to dig bamboo. After two years of Mary Ann having to dig all the bamboo, they decided something needed to be done. The result is a cleanly extracted division with soil intact around the root ball. This means the division is less likely to suffer transplant shock, often caused by accidental bare-rooting. After several years of design, trial and error, and numerous prototypes, they developed the Bamboo Spade. Along the way, the Silvermans realized the value of their new spade for not only those with physical limitations but also for anyone who digs bamboo or trees and shrubs, and they decided to produce additional spades for sale. Although the Bamboo Spade was designed specifically for bamboo, it has found favor among landscapers for general root balling as well. Click here to visit MidAtlantic Bamboo’s website. Landscape painters treasure great gardens, vistas, and natural settings, as the source material for their art. 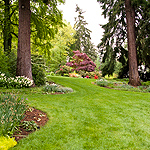 Landscape designers paint directly on the land and sky with plants and trees to create places where people can dream. A landscape painter may work for days, weeks, or months to see their work of art to completion. A landscape designer must visualize what their work will become over decades and even several lifetimes. This requires an understanding about how each particular life form will grow and perform over time and what effect its foliage, flowers, or branch structure will create? Landscape designers Glenn Withey & Charles Price have been applying their vision as “curators” at Dunn Gardens since 1997, building on a woodland backbone laid out in 1916 by the world renowned Olmsted Brothers landscape architecture firm. Hidden away in a north Seattle neighborhood, the 7.5 acre former estate is home to the only residential gardens in the state designed by the Olmsted firm that are still open to the public. 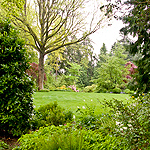 Dunn Gardens is listed on the National Register of Historic Places. When you look at a landscape painting, the artist invites you to imagine yourself in that landscape. When you are in a designed landscape you are actually standing in the artwork in real time. That’s when the magic begins. Withey & Price are modern day masters, who are well known in their field and revered by those already in the know. 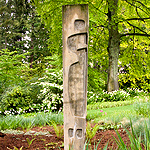 A visit to Dunn Gardens is much more than a visit to a park. It’s an opportunity to step into a 3-dimensional painting, a cross between something made by Mother Nature and something dreamed up by artists known as landscape designers, curators, and plantsmen. The garden can be easily compared to a painting, but in many ways it is more like a theater. The scenes are constantly changing, and while Mother Nature plays a part in those changes, it is the directorial hands of the curators that make sure the show is entertaining. 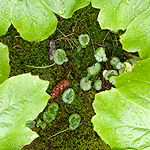 In one instance, I walked along a path lined with small-leaved plants and entered a garden “room” furnished with gigantic-leaved plants, leaving me with the feeling that I was shrinking. I’m unsure if the designers would admit to playing games with the visitors, but I think that’s part of their pleasure. As anyone who’s ever wielded a spade and secaturs knows, gardens don’t just appear out of one’s imagination, but require serious labor. 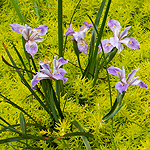 If not for constant cutting back, pruning, weeding, and digging-out by professional groundskeepers Roger Lackman and Zsolt Lehoczky, plants would overtake every path and climb over each other in a battle for territorial dominance. The Gardens change with the seasons. I visited mid-May, when epimediums, trilliums, podophyllums, and ferns ruled the ground with their textures and subtle colors. 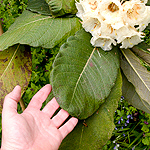 Rhododendrons owned the high ground with their bold flowers and leaves. I was told the moss garden is spectacular in February. The gardens are full of botanical events that we humans would ordinarily overlook. If a colony of tiny plants appear as if they are marching across a field of moss, perhaps it’s because they really are — in a time lapse that covers 3 feet in 3 years. Other plants like the majestic Cardiocrinum giganteum, the giant Himalayan lily, can take up to seven years to produce its huge, trumpet-shaped flowers on stems that can grow to 15 feet tall. In April they will still be hiding invisibly underground and will grow to maturity over the course of a few months, their entire lifespan occurring at a much faster pace than ours. 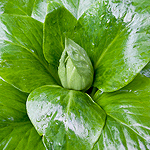 Seeing a Cardiocrinum in a backyard garden tells me that the gardener is a connoisseur. These spectacular plants are ubiquitous at Dunn Gardens, but there is nothing at all common about them. 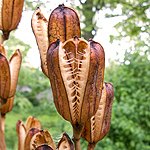 Even the dried stalks and seed hulls from last year’s blooms are visually striking, and are showcased like exotic wooden carvings in a giant ceramic urn. The gardens are open to the public on guided tours on Thursdays, Fridays, and Saturdays from April through July and September through October (closed in August). Admission is $10 for adults, $7 for senior citizens and students. Since private residences are still located on the grounds, admittance is by reservation only, and directions to the site are mailed only after reservations have been made. Children under 12 and pets are not permitted in the gardens. Spades & the Demise of Smith & Hawken. The author in one of his bamboo groves with a King of Spades long handled spade. As a longtime serious gardener I know the value of good tools and the pain and suffering caused by bad tools. Whether you’re breaking new ground to plant a tree, taking out a dead shrub, or that mother of all digging jobs, digging out bamboo, having quality tools makes an enormous difference. A great tool can multiply your work force exponentially, making your work a pleasure and saving your back. A cheap poorly made tool can make digging a misery, and injure your back, arms, or feet. When a cheap tool breaks the force is suddenly transferred to your body and can easily send you to the ER. After my 2-year old Smith & Hawken border spade broke (at the blade, not the handle!) I began a dedicated search to find THE BEST spade, one that would save my aging back in years to come. When I first began gardening more than 20 years ago, a friend in Boston encouraged me to buy a Smith & Hawken Border Spade and Fork. Smith & Hawken was a new company (founded in 1979), importing high quality gardening tools from England to the US where they were unavailable. Although relatively expensive when compared to American made shovels sold at hardware stores, the Smith & Hawken spade was a veritable Samurai Sword of garden tools. They were handmade by Bulldog of England at a 200-year old forge. The Smith & Hawken catalog featured the lengthy process by which the steel was rolled and forged into a tool that easily wore the lifetime guarantee. Here’s how tough that original Smith & Hawken (Bulldog) spade was. Amongst many other things, I grow about 15 kinds of bamboo. To divide bamboo I would sharpen my spade on a grinder and hit the spade on the treads with a sledgehammer, thus cutting the rhizomes. Eventually I knocked a tread off but a friend of mine welded new ones on. Neither the handle nor blade ever broke or even complained. I still have the Smith & Hawken (Bulldog) tools I bought back in 1984, but have retired the spade as an heirloom to be used only for light digging. I bought a new replacement Smith & Hawken spade a few years ago. It looked very similar to the Bulldog spade but did not feel as heavy. This Spring, while digging out a small Pampas Grass, the blade snapped vertically down the middle. Not the wooden handle as you might expect, but the steel blade! I knew this could not be a genuine Bulldog-made spade but one made from cheap inferior steel. I was in communication with Smith & Hawken’s corporate office for this article, when they suddenly announced they were shutting down after 30 years of business. I immediately went to one of their Seattle stores and “exchanged” the broken spade for their current and final model, which is very much a toy when compared to their original product. It reminded me of the “Where’s the beef?” commercial where it’s all bun and no meat. Their final model has a pretty patina, but is miniscule in proportion to the already small border spade. Suitable for a child to dig at the beach with but not for the serious gardener. I see the evolution of this product as analogous to Smith & Hawken’s demise and perhaps a parable for American business. They started out with a simple great idea, grew it into a world-renowned business, sold it to a large corporation, which then sold it to another large corporation, that turned it into a purveyor of over-priced things that people don’t need (waterproof large screen TVs that you can keep next to your pool). To increase profit margin they made cheap knock-offs of their own garden tools. When that wasn’t enough they made the garden tools smaller, but more prettily packaged. In the end, the tools that were at the core of their original business became useless vestiges, like hind limbs on whales. Then they went out of business. So much for the lifetime guarantee! I plan to give the replacement spade to a young child as a birthday present. Left to right: Vintage 1984 Smith & Hawken (Bulldog) spade, 2009 Smith & Hawken faux spade, King of Spades 15" straight edge blade with cushioned rubber treads. So, what’s a serious gardener to do? As a lifetime do-it yourselfer I’ve realized that you are already saving lots of money on labor, so you might as well buy professional quality tools to make the job easier. How many times have you bought a cheap tool, only to replace it after it broke? “Buy cheap, buy twice” the saying goes. While taking photos for a recent project for Dunn Gardens, I watched the professional groundskeepers digging out some shrubs. They were using a heavy duty all-steel long handled spade with big rubber treads. I realized that I needed to get my hands on one of these and run it through its paces. After searching the internet and finding a variety of similar looking tools (of different weights) I discovered the genuine article, The King of Spades, made by a small family-owned company in New Jersey (W.W. Manufacturing). They make a wide range of shovels and spades including something they call a Ground Shark with a serrated edge on the side of the blade. These industrial grade tools are made from aircraft-quality steel to suit the needs of professional landscapers and nurserymen. You won’t find them in your local hardware store but you can purchase them directly from W.W. Manufacturing. Their simple catalog is a compendium of digging tools, each engineered for a specific purpose. I counted 32 different styles of serious digging tools, with and without handles, diamond point and straight edged — no pretty packaging or faux patinas. I only preach about Made in America when the quality is worth the price, and that is the case here. The spade I am reviewing has a very long (50″) handle and (15″) blade for tackling digs requiring a lot of leverage that would break most spades and shovels. It’s the most expensive in the King of Spades line, selling for about $120 with a foot pad for heavy stomping. Most of their digging tools cost in the area of $70-$100 depending on the style. When comparing price to value I figure one visit to the chiropractor or several days of missed work or lost sleep due to an injured back make this a good value. That’s if it truly makes a tough job easier and safer. In a field test dividing and digging out a Pampas Grass I found that I could use all my strength and weight on the handle of this spade and it showed zero signs of bending or stress. The sharp blade and foot pad allowed me to comfortably cut through roots and hard soil. It’s a fearsome weapon for those of us who consider digging a sport. Now, when friends ask me for clumps of some of the rare bamboos I grow I’ll let them borrow the King of Spades. I won’t have to worry about them breaking my heirloom wooden handle tools. In search of the best gardening tools: Spades & the demise of Smith & Hawken. Click here to see a portfolio of my work and learn more about design solutions for marketing your business.